Last year, there was a lot of hullabaloo about the proposal that Bangsa Moro history be taught to Filipino high school students. The Office of the Presidential Adviser on the Peace Process (OPAPP) and the Department of Education spearheaded the proposal. There was applause everywhere, including among the Moros. Some Moros were happy and even proud that their history would finally be studied in schools, as if the Moros were never mentioned in Philippine secondary school textbooks. In the first place, the Bangsa Moro is NOT absent in Philippine textbooks — elementary, high school or college textbooks. The Moros have always been mentioned — but usually as heathens, bandits, outlaws and later, terrorists. They are portrayed as heathens, infidels and pirates whom the Spaniards regularly “punished” by sending “punitive expeditions” to Moroland every so often. In the American period, the Moros were portrayed mostly as bandits and outlaws. And in contemporary Philippines, Moros are portrayed in the media and some textbooks as terrorists. History is “the act of selecting, analyzing and writing about the past. It is something that is done, that is CONSTRUCTED.” (Davidson and Lytle 1982). Much of the “official” Philippine history is a CONSTRUCT of the indigenous elites (but they refuse to be called indigenous!) of Luzon who came into political and economic leadership during the American Occupation. The country’s “official” history can be defined as history generally taught in schools and propagated by government institutions. 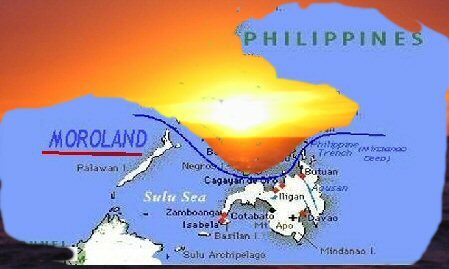 The official historical view claims that 350 years of Spanish rule in the Philippines included Moroland – and that the Moros and the non-Moros have a SHARED HISTORICAL EXPERIENCE (which is FARTHEST from the TRUTH). Spanish attacks against the Moros were called “punitive expeditions against rebellions.” Moro victories over the Spanish were denied or ignored. Moro raids on the Christian natives were called pirate attacks. The same with the American regime. Teaching this history to Filipino students – whether in elementary, high school or college – is NOT going to bring about unity in the country. On the contrary, this will deepen the divide between the Moros and the Christian majority. The Filipinos do not even have full comprehension of their history, how can they teach Moro history? I once gave a seminar on Philippine history to faculty members of an exclusive school in Metro Manila. Most teachers there did not know a lot of their own history. They could not even answer my questions. And what kind of Moro history will they teach? They will boast that Sultan Azim ud Din of Sulu (Alimuddin) was the only Christian Sultan of Sulu? They will not explain or could not explain the context of the conversion and the whole socio-religious-political situation of that long period in Philippine-Moro history. And that would take a lot of explaining to elementary students. Also, “official” Philippine history began in 1521 with Magellan’s “discovery” of the Philippines. The period before that is Philippine’s pre-history. By that time, various Moro datuships, rajahnates and sultanates – esp, the Sultanates of Sulu and Maguindanao and the Rajahnate of Buayan — were already established. By that time, the Moros had already engaged the Portuguese in battles in Mindanao and Ternate. In short, Moro history predates “official” Philippine history. So how can Filipino history teachers teach what they had not studied? It is easy to say to teach Moro history to Filipino students. But what kind of history? Whose version of history?“Official” Philippine, including Moro, history is still being constructed since the American era by the country’s powers-that-be. Perhaps we need to let Philippine historical studies undergo some form of Heideggerian destructuring (destruktion) or Derridean deconstruction before we can even begin talking about teaching Moro history to Filipino school children. Let the Moros concentrate on getting REAL AUTONOMY or SELF-DETERMINATION for the Bangsa Moro — be it a federal state, sub-state or independent state. Let the teaching of history come later. Perhaps, the people who are in most need of learning Bangsa Moro history are the Moros themselves.